For 11 weeks in the summer of 2017, I was the product design intern at Xero, an online accounting software for small businesses in New Zealand, Australia, the US, and the UK. During my internship, I worked on improving the employee onboarding experience for Xero Payroll (US). I worked on competitive analysis, ideation, prototyping, and user testing. I collaborated with other designers in the US, Australia, and New Zealand, as well as product managers in the US. An employer's experience of adding employees into Xero Payroll is currently frustrating, tedious, and has a low completion rate. The goal of my project was to improve this process, so that employers could have a more efficient and enjoyable experience of setting up Xero Payroll, and ultimately, focus on the important things in their small business – doing what they love. Before looking into any specifics of the project I was working on, I spent nearly three weeks (and arguably my entire internship) understanding every piece and interaction of the overall Xero product, from the core accounting software to payroll and other services. I built an object model documenting the Payroll product in order to have a concrete, visual map of the overall product space that I was working in. Employee onboarding: Adding an employee into Xero Payroll is frustrating, tedious, and often confusing. Timesheets and Time off: The information architecture associated with timesheets and time off is disorganized, leading to confusion, as well as redundant requests and approvals. Team management: Related to the above issue, information architecture of employee permissions and managing other employees is unclear. After considering impact of the issues, design difficulty, work that the design team was already prioritizing, I decided to focus on employee onboarding. Diving into my project, I conducted competitive analysis to understand how other online payroll services approach setting up payroll and employees. Additionally, there was already a solid base of user research conducted with Xero subscribers, and I was able to leverage relevant studies to understand small business owners' needs and the current state of Xero payroll and employee onboarding. From competitive analysis – all other payroll services I looked at offered some level of invitation to an employee to fill out some amount of their personal information. 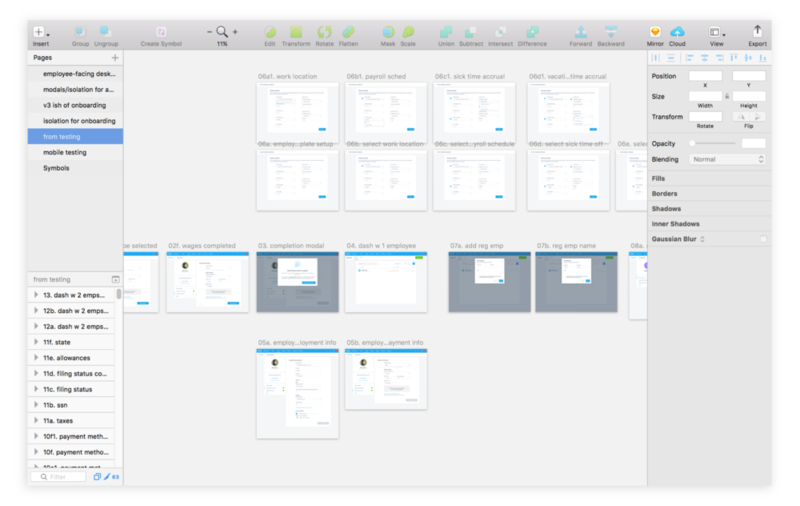 I was able to leverage past work and ideas related to Xero Payroll and employee onboarding to begin building flows, sketching, and wireframing. The four major design directions I hashed out were employee self-onboarding, bulk adding and inviting employees, employee defaults or templates, and importing a CSV file of employees. Figuring out legal boundaries for online onboarding- what entry fields are legally required? Can filling out an online form equate filling out a paper tax form like a W-4? Should there be employee setup in the wider Xero payroll setup, and what would the employee profile look like? I was considering all of these parts of employee onboarding because all elements are related. After presenting some mid-fidelity work to product designers and product managers, as well as considering my desire to design for small business owners, I decided to focus on self-onboarding and employee defaults. Should the onboarding process be within the profile or in an isolation mode? How should the entry fields be organized? Required vs. optional? Are there technical or legal constraints for grouping certain entry fields together? Should employers be allowed to override self-onboarding invites? If so, should it be a broad override or just for certain fields? I conducted unmoderated remote tests through UserTesting.com on the employer-facing flow for adding employees to their organization, as well as the employee-facing mobile flow for self-onboarding. The goal of these tests was to understand how employers responded to self-onboarding and employee defaults – would these be features that they would want to use? Would these features significantly improve the process of adding employees into Xero? I had 5 users with some experience employing people at a business walk through the process of adding employees into Xero Payroll. Most users were confused whether they completed onboarding an employee – most tried to move onto the next task too early. In the next iteration, I added stronger visual communication of the employer's progress through adding an employee to Xero. Generally, few users picked up on the visual used to communicate that a field was defaulted. When asked to change a field that was defaulted in the profile, some users knew exactly what to change, others had a bit of trouble, some completely missed the fields to change. In the next iteration, I adjusted the visual design in the default setup page and within the profiles to create a blue "active state" for defaults that were being used. I also thought about adding more friction to the onboarding process – potentially, if defaults were active for an employee, there could be a screen that asks an employer to confirm the employee's information, giving the employer another opportunity to double check that the defaults and all information are correct. Employee testers were asked to walk through the prototype as if they were onboarding to "Barkery" on Xero. While working on the desktop screens for the employers, I also explored mobile self-onboarding for employees. I briefly tested this employee flow to understand if mobile self-onboarding made sense – would employees feel comfortable entering personal info (especially info like social security number) into a mobile interface? I had 5 remote testers walk through the mobile prototype of completing information in Xero Payroll. Most employees were comfortable with submitting personal information into the mobile interface, and the main issue that came up in testing was the content: some employees mentioned that if they were just starting out with a job, they might not know what a "withholding" is in taxes, or the difference between a check and direct deposit. Learning from the feedback that I received from the user tests and from stakeholders involved with Xero payroll, I created final iterations of my screens, which I presented to designers, product managers, and developers at Xero in the US and global offices. The final screens can be found at: employer-facing screens and mobile employee-facing screens. The design team at Xero is currently working on a redesign of Payroll, which will include a redesign of the employee onboarding process for Xero payroll. I had a great summer working with Xero, and I'm excited to see how the product continues to evolve in the future!